In my last few posts, I have recollected how back in 1985, I thought several great rockers from the 1970s had sold out and gone too commercial only to realize that I was wrong when finally getting around to listening to their album. However, I never said this about guitar god Eric Clapton when his “Behind the Sun” album came out in the same year. Ironically, all the music critics at the time said he did exactly that, citing his collaboration with Phil Collins on the album. One said that Eric was in danger of turning his back on his faithful following and liable to end up playing his greatest hits on the Vegas circuit. What do critics know? 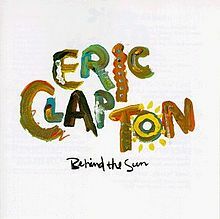 If Eric Clapton sounds new wave or too commercial on the “Behind the Sun” album, I sure as hell don’t hear any evidence of it. To me, this was Eric Clapton at his usual best. Even looking at the two singles released from the album, “She’s Waiting” and “Forever Man” do not give me any thought that he was trying to go too commercial 80s here. “She’s Waiting” is everything I had always remembered and liked about his music and “Forever Man” reminds me of his great hit with Derek and the Dominoes, “Layla.” So again, I shoot down the accusation that Eric was trying to sound too commercial. One song that totally refutes that claim is my vote for hidden gem, “Same Old Blues.” Here, he shows how he got the nickname ‘Slow Hand’ as he solos all through the song, classic blues guitar at its very best. Some my counter claim by citing his cover of the 1979 disco hit by one hit wonder Amii Stewart, “Knock on Wood.” Clapton’s version of this song sounds nothing like the original disco tune. He puts his own spin on the song, that’s a certainty. If there’s any variation from traditional Clapton, it has to be with “See What Love Can Do” which sound rather calypso but it’s played very well with a classic Clapton guitar solo it. In fact, what I love about the album is the fact that he solos his way all the way through it and that’s what I have always liked about him. He is truly a guitar god. When “Behind the Sun” came to my attention, I was glad that a classic album from a great musician was able to fill the gap in what was a few metal starved months for me. This album was never too 80s pop in my view, it just cooks.